Recent START Seminar lecturer Erica Chenoweth received top honors for 2011. Her book, "Why Civil Resistance Works," was named a book of the year by psychologist and popular science author Steven Pinker. 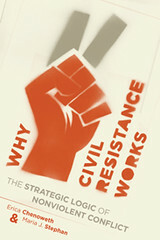 Co-authored by Maria Stephan, the book analyzes how and why civil resistance movements are more effective than violent campaigns. To learn more about her new book or to purchase it, visit here.